Editor's note: Over 3 million businesses have adopted Google Apps. Today we’ll hear from David Bullock, CFO of YETI Coolers based in Austin, Texas. To learn more about other organizations that have gone Google and share your story, visit our community map or test drive life in the cloud with the Go Google cloud calculator. YETI Coolers, co-founded in 2005 by brothers Roy and Ryan Seiders, offers durable, super-insulated ice chests for serious outdoor enthusiasts. Roy first recognized the potential of a premium cooler during an early entrepreneurial endeavor and decided to design his own. He recruited his brother to help and the two settled on YETI for the company name – a new brand that consumers could easily associate with frigid toughness. Today, YETI coolers are “certified grizzly-proof” and distributed through over 500 dealers across the country. When Roy and Ryan started the company, they recognized the value of Google’s free email service, Gmail, and started with one email address – yeticoolers@gmail.com. However, fast forward three years and the company had grown to 10 employees. We hit a tipping point where we needed to expand and create a more professional look with @yeticoolers.com email addresses. The question was how to retain three years of information and still offer the entire office the same easy-to-use interface and access to remotely-stored email history. The solution was Google Apps. Soon after implementing Google Apps, we hired our first National Sales Director who resides in North Carolina. Despite the geographical barrier, Google Docs has allowed us to collaborate with him and other remote employees in real time, and has became a critical component of our sales process. Our goal is to increase the number of dealers that sell YETI coolers but for a long time, our volume of dealer inquiries was unmanageable and we missed out on sales opportunities. This is where a Google spreadsheet saved us. We created a “Potential Dealer Tracker” to track, prioritize, and, most importantly follow up with potential YETI dealers. By capitalizing on dealer inquiries in an organized, methodical way, we’ve been able to convert 30% more leads just this year. The profit from the new accounts nearly pays our National Sales Director’s salary! We also use Google Calendar to track internal and external meetings and even non-work events like Red Raider and Longhorn football games. More recently, we started using Google Sites and launched our company’s first intranet. We look forward to adding even richer content to the site as the company continues to expand. Given the rapid growth we’ve experienced over the last few years, it has been extremely difficult to stay on top of all areas of the business. Google Apps has changed this, providing the tools we need to succeed. It’s low cost, secure and easy to use – from our standpoint, Google Apps is the perfect solution for any small business. Congratulations, you have made it to the final installment of the Google Media Solutions series! We get frequent questions about Google TV Ads; whether it's the right platform, how much it costs, how it works. Here’s your crash course. Google TV Ads is an online marketing place that allows anyone to launch national TV campaigns and measure their success with timely reporting. Google TV Ads allows you to buy the programs that you want without bundling, pay only for impressions delivered and access viewership data from a sample of millions. Does TV advertising fit into my marketing mix? Television advertising allows you to reach a wider audience than any other advertising medium. Generate brand awareness and demand through sight, sound and motion. It’s also a great supplement to any online strategy - read how ooVoo used TV to drive a 500% increase in site traffic. We want to get started, but we don’t have a commercial. Can you help? Of course! You can use the Google Ad Creation Marketplace to connect with professional ad production houses for as little as $200. Creating compelling, effective TV ads at relatively low costs has never been easier. But is TV Measurable? If you have a website, we recommend tracking and comparing website visits with your TV campaign metrics using Google Analytics. Google Analytics can track TV campaign metrics like TV impressions alongside daily web traffic volume.What does it take to get started? Create a video ad, log into AdWords, choose targets and shows and see your ad on TV within 48 hours! Visit the Getting Started Guide for more tips. This post concludes our Google Media Solutions series. Over the past four weeks, we have reviewed Google AdWords, the Google Display Network, Remarketing, YouTube and Google TV Ads. Hopefully you have learned some tips and tricks along the way. The Google Media Solutions series has been cross-posted from the Google Agency blog, as the solutions outlined there are fully applicable to small businesses.
. YouTube reports that it has served its 500,000,000th Promoted Video view this week and has seen a six-fold increase in clicks it has delivered to businesses such as Shopper’s Choice, Dynomighty and Orabrush. This ad product combines the branding capabilities of video with the direct response action of search advertising, allowing advertisers to promote their videos against search results or related videos on YouTube. For more information on this announcement, please visit the YouTube blog for the full story. How do you increase sales and build your brand when you’re on a limited budget? You might consider using YouTube’s Promoted Videos. YouTube reports that it has served its 500,000,000th Promoted Video view this week and has seen a six-fold increase in clicks it has delivered to businesses such as Shopper’s Choice, Dynomighty and Orabrush. This ad product combines the branding capabilities of video with the direct response action of search advertising, allowing advertisers to promote their videos against search results or related videos on YouTube. For more information on this announcement, please visit the YouTube blog for the full story.
. This series has been cross-posted with the Google Agency blog, since many of them are applicable to the small business owner. In this post, we will review the Google Display Network. The Google Display Network is a large group of websites and blogs that display AdWords ads and allows advertisers to scalably reach their customers at moments of relevance. People are using it for direct response, web engagement as well as driving offline conversions. We have rolled out many new features for the Google Display Network. One that we would like to highlight is remarketing. Google remarketing uses custom technology to reach potential customers who have previously visited your website. Implementing the remarketing tag is very easy; you simply add a pixel to your website. After adding the pixel, you can use remarketing to help capture additional sales or leads by re-targeting users who have already visited the site, and generally convert better and at a lower CPA. To learn more about remarketing and other innovative targeting options on the Google Display Network, you can check out this post from the Google Display Network blog series. I’ve tried the GDN before - what has changed? : The Google Display Network has changed a lot in the past few years. Today, the median advertiser gets approximately 20% of their conversions from the GDN at a CPA that is comparable to search. * To drive results like these, we are investing heavily in many new features that make the GDN an effective platform for advertisers with any marketing objective. Examples of features we've introduced over the years include site exclusions, above the fold targeting, frequency capping, and consolidated view-through conversion reporting. The Google Display Network only works for branding: Contextual targeting and remarketing are just a few examples of great tools that direct response marketers can use to reach potential customers in the later stages of the buying cycle, like consideration and decision. The Conversion Optimizer can also help you generate additional conversions at an attractive cost-per-acquisition (CPA). With powerful tools like these, you can make sure you are capturing all your potential customers as they spend time across the web. Thanks for reading the third part of the Google Media Solutions blog series. Next, we will discuss how you can use Google TV to drive results for your clients. Welcome to the third installment of the Google Media Solutions series. This series has been cross-posted with the Google Agency blog, since many of them are applicable to the small business owner. In this post, we will review the Google Display Network. The Google Display Network is a large group of websites and blogs that display AdWords ads and allows advertisers to scalably reach their customers at moments of relevance. People are using it for direct response, web engagement as well as driving offline conversions. As a local business owner in today’s day and age, you know that it’s important to have an online presence because that’s where your customers are. In fact, research shows that 97% of people conduct research online before buying locally. 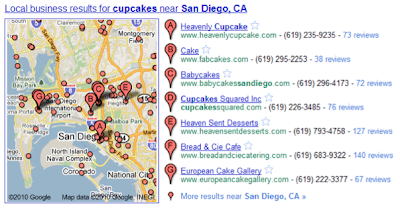 Hopefully you’ve gone to Google Places to claim your free business listing that appears on Google and Google Maps. That enables you to share accurate information about your business such as your hours of operation, photos and videos - and now you can do even more. Today, we’re announcing the availability of a new online advertising solution to help local businesses connect with potential customers in their area. Boost enables business owners to easily create online search ads from directly within their Google Places account. No ongoing management is needed after the initial set up, and this beta is currently available to select local businesses in San Francisco, Houston and Chicago. 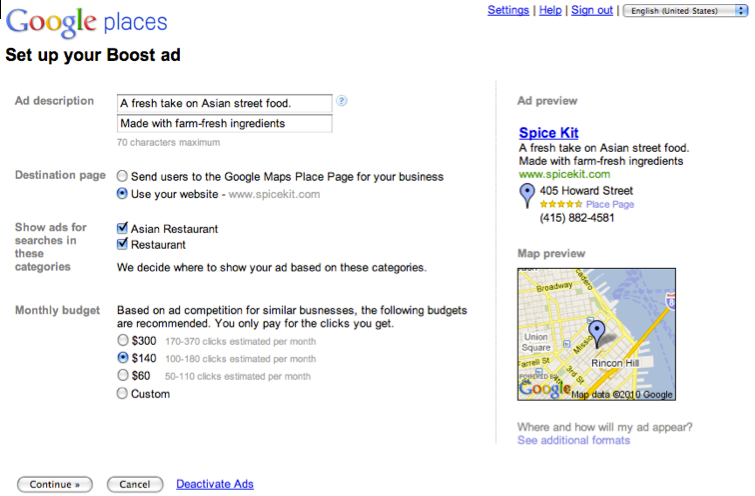 Boost ads are eligible to appear in the “Sponsored Links” section of Google.com and Google Maps search result pages. 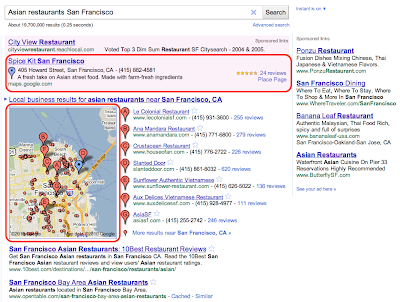 For example, if you’re a restaurant owner in San Francisco who has signed up for Boost, your ad may show up when someone does a related search like the one below, indicating a cuisine and location that matches yours. Beyond the basics like your company name, address, phone number and website, your ad may also include the number of reviews you’ve received, an average star rating and a link to your Place page to help potential customers find additional useful information about your business. 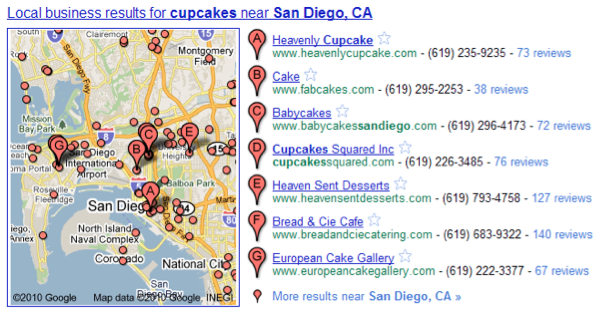 When a map appears alongside the results, a blue pin will help folks quickly find your location on the map. 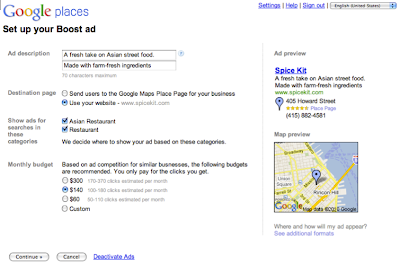 Businesses using Google Tags will also see their yellow tag appear in the ad. To create your ad, all that is required is a short business description, a web or Place page, your business categories and a monthly budget. From there, our system automatically sets up your ad campaign - figuring out the relevant keywords that will trigger your ad to appear on Google and Google Maps, and how to get the most out of the budget you allotted. You’ll only pay when a potential customer actually clicks on your ad, and you can also view basic ad performance data from your Google Places dashboard. Here is an example of the simple sign up page within Google Places, which takes just a few minutes to complete. To make the process even easier, the “description” and “categories” fields may be pre-populated with suggestions based on the information you provided on the Place page for your business. We hope Boost provides busy local business owners with a quick and easy way to share information about themselves with the people who look for them online. Placement in the “Sponsored Links” section of the page will, as always, depend on factors such as your ad’s relevance and quality. Boost does not affect the ranking of the free, organic business listings in any way. As we do with all beta features, we’ll carefully review the data and effectiveness of this trial and may make changes before making decisions about any future expansion. In the meantime, business owners can sign in or claim their listing in Google Places, and select businesses in San Francisco, Houston and Chicago will see an invitation to try Boost in the account dashboard. Interested businesses outside these areas can sign up to receive notification when Boost comes to their area by filling out this form. Editor's note: Over 3 million businesses have adopted Google Apps. Today we’ll hear from Dustin Bonnema, Portfolio Analyst and IT guru for MainStreet Advisors based in Chicago, Illinois. To learn more about other organizations that have gone Google and share your story, visit our community map or test drive life in the cloud with the Go Google cloud calculator. As the company grows, it has become harder to locate and share updated information and policies across all employees. Google Sites is solving this problem – we built an intranet that includes links to shared calendars, client websites, group email aliases, expense reports, gift matching instructions, and investment policies. A Google form is also embedded in the site so employees can submit vacation requests that are updated directly in our HR manager’s spreadsheet. In time, we plan to add even more to the site – we’re already showing gadgets with intra-day performance of market indexes across the world and we’d like to add a map of client locations and charts outlining our company assets over time. Over the next four weeks, the Google Agency Blog will be debunking common myths, passing on easy implementation tips, and sharing general how-to of Google advertising. We'll be cross-posting to this blog, since most of the tips are relevant to small businesses. You'll be able to find all the tips in one place under the label 'Google Media Solutions Series'. Online video represents a huge opportunity to reach potential customers with new, compelling formats. YouTube is the perfect platform to reach these customers, drive sales and enhance branding initiatives. There are many benefits to advertising on YouTube. It is a unique platform which allow you to reach potential customers who are engaging online. You can set up YouTube campaigns through the AdWords interface. With our new YouTube Video Targeting Tool, you can target specific audiences based on interest, demographic or specific video content. You can create a message and share it with consumers with their videos or display ads. Additionally, after running a campaign, you can use YouTube Insight to learn how potential customers are interacting with your videos. I am not sure if my audience is on YouTube? : Your audience is watching YouTube videos. YouTube has users of all ages and 32% of users are between the ages of 35 and 54*. In fact, if the YouTube audience were a country, it would be the 3rd largest country in the world with over 420 million unique visitors every month. We don’t have video content. How can we use YouTube? : You don’t need to have video content to advertise on YouTube. You can target your audience on YouTube with display, text or video ads. Our recommendation, since YouTube is a visual medium, is to test out display ads. Is there professional content on YouTube? : YouTube has over 3,500 content partners, including CBS, TV Guide, Fred and JuicyStar07. Our partners are actively uploading content and the video landscape is constantly changing. As this is the case, your target audiences are returning to see new, updated content on YouTube! Check in next week for the third post, which will be on the Google Display Network, Remarketing and great tips for reaching your customers while they browse the web! So, let's get started with Google’s search marketing product, Google AdWords. Using Google AdWords, you can target Google.com and the Google Search Network. This is a great solution to connect with potential customers who are searching for your products and services. It is flexible, measurable, and accountable. With AdWords, you can easily manage the spend of your account and control costs by setting a daily budget and maximum cost-per-click (CPC). Another benefit is that it’s easy to make changes to your ad text, as changes to ads take affect almost instantaneously. Lastly, as an added benefit, you can track the return on investment (ROI) of your account by using Conversion Tracking or Google Analytics. My website shows organically, so I don’t need to advertise: It is great to have a highly ranked organic listing; however you can’t control the message to your potential customers with organic listings in the same way that you can control it with search marketing campaigns. By advertising on Google.com and the search network, you can control the message that you share with all potential customers and determine the landing page to which you direct your potential customers after they click on the ad. These features can lead to increased sales. In addition, organic results are likely only capturing a very small portion of the relevant traffic on Google. For example, a consumer electronics advertiser might appear high in the search results for their brand terms, or specific trademarks relevant to their company, but AdWords can expose their message on a wide variety of related terms like 'digital cameras' 'netbooks' and 'HD TVs'. Competitors can click on my ads maliciously: We take the security of AdWords accounts very seriously and have many resources in place to prevent your account from accruing invalid clicks. While invalid clicks occur less often than commonly perceived, we have three filters in place to protect your account: detection and filtering techniques, advanced monitoring techniques and manual reviews from our team. Stay tuned for next week’s post on the Google Display Network, remarketing and great tips for reaching your customers while they browse the web! Editor’s note: Over 3 million businesses have adopted Google Apps. Today we’ll hear from Patti Sprague, Managing Director of Premier Guitar in Iowa. To learn more about other organizations that have gone Google and share your story, visit our community map or test drive life in the cloud with the Go Google cloud calculator. Premier Guitar is for true guitar enthusiasts, a magazine focused on guitar gear and the musicians who use it. All of our employees are passionate about music, and many play guitar or other instruments. Working with a bunch of musicians creates a fun, creative workplace, but not always a very structured environment. We needed an email system that didn’t tie our team to the office, but allowed us to work together and stay connected wherever we may be. Google Apps was the perfect solution. In our business we have very tight deadlines. We do things a little differently than other traditional magazines. We not only publish a print version of our magazine, we make all of our content, current and archival, freely accessible over 5 different platforms. We’re able to successfully compete with some of the older print centric publications out there because we’re lean and we can get stories up quickly. That requires a lot of team work. Google Docs allows us to work on a story from wherever we are and get it published quickly. It would never be possible to work as efficiently or collectively if we had to wait for a new version of a document to be sent to us before we could publish. Often our writers and photographers will need to drop everything to hop on a plane for a last minute factory tour, or an interview with an artist. One of the reasons we started using Google Apps is the ability to access our email and calendars on our mobile phones or anywhere with an internet connection. With Google Apps, we know where the team is and what’s due based on our shared calendars. Our company calendar and editorial calendars are kept up to date so we can get our stories out quickly. Plus, we can always just hop on Chat to ask each other questions or find out the status of a shoot or a photo shoot or piece. Being able to just ask a co-worker a quick question instead of sending them an email and waiting for a response has really helped keep projects moving along. Apps helps us stay connected and work together, while still having fun doing what we love. For a lean team that wants to meet deadlines while writing about their passion, Google Apps was the perfect choice. Users search on Google.com and Google Maps because they’re looking for relevant, high-quality content that answers a question or fulfills a need. This useful information often appears in the form of business listings on the search results page, and these free listings are an important way for local business owners to connect with potential customers. We want to help you make the most of your business listing, so this is the first post in three-part blog series about how to set up a clear and effective business listing via Google Places. This first installment delves into the specific topic of business listing titles — also known as your company or organization name — and highlights some of the common issues business owners encounter when creating a listing. Company/Organization: Fly Fishing Frankie’s Ltd. The title of your business listing should reflect the exact name of your company or organization as it’s used in the real world. While it’s acceptable to leave off company extensions like Ltd, GmbH or Inc, since those identifiers aren’t helpful to users, be sure to avoid adding any descriptions that aren’t part of the official business name or making any modifications to the official name. Your business listing title must match the business name you use in the real world (e.g. on signage, letterheads or business cards) in order to comply with our Google Places quality guidelines. Listings that are in violation of these guidelines may be suspended and won’t appear in Google search results. Here are some additional reminders about business titles based on some of the offending listings we see and have to suspend. We also let you know how and where to include specific information you want to provide potential customers, while complying with our quality guidelines. Note: While the “Company/Organization” field may only contain the name of your business, if you’d like to provide more information about your business’s classification or industry, you can do this by selecting the appropriate categories. You can also provide a more detailed description of your business - such as what you do and the the services you provide - in the “Description” field or on your company website. Note: To indicate the location of your business, please use the appropriate fields marked “Street Address,” “City/Town” and “Postal Code.” Adding location-specific information in the title of your listing is not necessary since our system automatically uses your address details to determine the search queries for which your listings would be geographically relevant. If you’re concerned that your business is difficult to find or part of a shopping mall or complex, you can provide users with further guidance about where to find you by adding that information in the “Description” field. [Example title violation] FLY FISHING FRANKIE’S LTD. Note: In order to ensure that the Google Places business listing results are useful and easy to read, please refrain from using visual gimmicks. Business titles, as well as addresses, should always use standard capitalization and punctuation. The above examples may not cover all cases of business title violations, but we hope we were able to highlight some of the common mistakes we’ve seen. By avoiding these errors when setting up your business listing title, as well as reading through the rest of our Google Places quality guidelines, you should be in good shape to create an optimal and compliant listing. If you realize that your existing listing is not compliant with our quality guidelines, we encourage you to sign in to your Google Places account to make the required changes and avoid getting temporarily suspended for violating the guidelines. We hope you find this information helpful, and if you have further questions about business listing titles, visit our Google Places help forum. Last week we posted some tips to help you move from Microsoft Outlook® and other client-based software to Google Apps. Today we’d like to share some more thoughts on making the most of Gmail. A busy day often affords few email breaks. When you do get a chance to scan your mail, Priority Inbox helps you prioritize by identifying the messages that require your immediate attention. Gmail uses a variety of signals to predict which messages are important, including the people you email most and which messages you open and reply to. The best part is it gets better the more you use it. Turn on and manage Priority Inbox in your mail Settings – and read our tips to become a real Priority Inbox whiz! We work with people in multiple ways, and Gmail makes it easy for you to choose the most effective means to communicate: email, chat, text messaging, video chats and phone calls are all available from your inbox. For example, voice and video chat lets you have an actual conversation with someone or meet face-to-face in brilliant resolution. And for those early adopters transitioned to our new infrastructure, we recently added the ability to call phones in Gmail, so you can place phone calls from your computer to any landline or mobile phone number and receive calls as well. For phone calls and video chat, download this plugin to get started. Attachments in other email systems can be cumbersome; they take up space, can be hard to find and you have to open another program to take action, which slows you down. Gmail has some helpful features that let you quickly view attachments without the need to open or download them on client-side software. The Google Docs Viewer allows you to view .doc, .pdf, .ppt and other attachments in a new browser tab simply by clicking the "View" link at the bottom of a Gmail message. If you decide you want to edit the file, click "Edit online" to open it in Google Docs, or download it to your desktop. Gmail also includes a Google Docs preview lab that lets you read the entire contents of a Google document, spreadsheet or presentation right in Gmail. Note that your administrator needs to have enabled Labs for you to access them. Wouldn’t it be great if you could update a sales lead without leaving your inbox? With contextual gadgets, you can. They display information from social networks, business services, web applications and other systems, and let you interact with that data right within Gmail. Your administrator or any third-party developer can build and distribute Gmail contextual gadgets to the domain with just a few clicks via the Google Apps Marketplace, which we launched in March. To learn more, browse for apps in the Marketplace that have ‘Mail Integration’. With Gmail, we built in keyboard shortcuts to help you get through your mail quickly and efficiently. Once you enable this feature in Settings, you can archive (e), reply (r), compose (c), delete (#) or take just about any other action with one key or a short combo. For a handy guide, type “?” while you’re in Gmail – for maximum efficiency, print it out and post it at your desk. Gmail Labs give users experimental – sometimes whimsical – features to customize Gmail in a way that works best for them. Some Labs accommodate preferences, such as adding a “Send & Archive” button, while others help you communicate, such as the Google Voice player and SMS in Chat. Still others help you stay organized, like the Google Docs and Calendar gadgets. If your administrator has enabled Labs for your domain, check them out for yourself. What’s your favorite feature in Gmail? Feel free to let us know in the comments below. Happy (productive) emailing! As the holidays approach, we’ve put together five quick and easy ways Google Places can help your business reach customers. Create a coupon highlighting holiday specials: Are you offering a package of products or services to your customers this holiday season? Let people know by creating a coupon for your special on your Place page. From your Places dashboard, click on the “Coupons” tab and then “Add a new Coupon.” Fill out a few details and watch your coupon go live! You can also give the coupon an expiration date, so it only runs for a set time period. 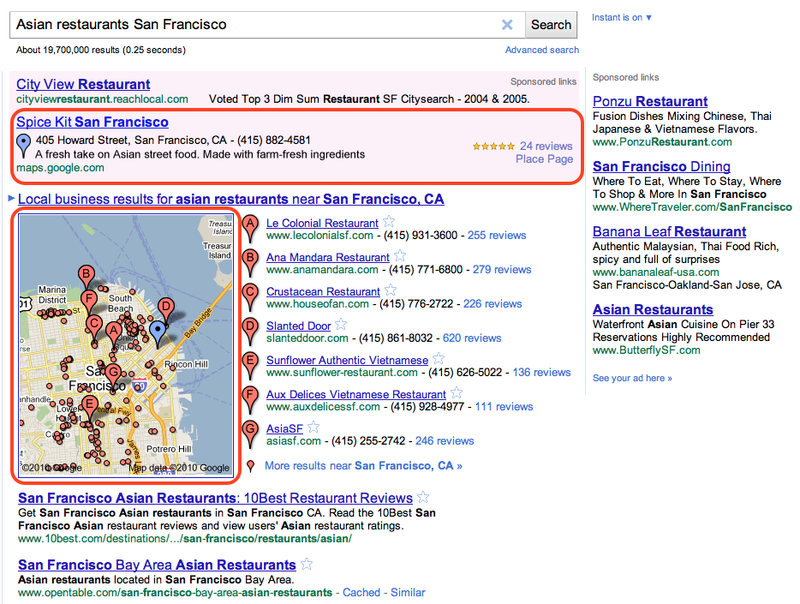 Coupons are also a great way to track how many customers found you through Google Places. For more details on creating a coupon, check out our Help Center. Link to a menu of holiday offers and prices: Manage the holiday rush by providing a link to your menu of products and services, or even your reservation page, on your Place page. To add your link, sign in to your Places dashboard, go to your listing and click "Edit." Scroll down to "Additional Details," add a column by typing in the label “Menu,” and then enter the URL of where you host your menu! If your website also handles reservations, then you can link to “Reservations” too. Check out this example and sign in now to add your links. Make your business listing stand out with Google Tags: Show customers your holiday offer or menu when they search on Google and Google Maps. Tags are yellow markers that allow business owners to highlight important or unique aspects of their business, such as that coupon you’ve just created, a video, photos and more. To create a tag, go to your Places dashboard and click on “Add a tag.” Simply choose your tag type and let it run. To get you started, we’re giving business owners 30 days free! Update your holiday business hours: Are you extending your operating hours on some days to accommodate the holidays? Update the business hours listed on your Place page for the days you’ll be open early or late. This helps local customers, especially last-minute shoppers, who may be interested in visiting your store take advantage of your extended hours. Write a post to engage with your customers: Whether you’ll be closed for a certain holiday or open on days when most businesses aren’t, a post is the perfect way to let your customers know. You can also use it to tell people about your latest shipment holiday inventory. Posts are short custom messages of up to 160 characters and appear on your Place page. For more details on writing a post, check out our Help Center. You can also highlight your post with a Google Tag. With the tagline, “we smoke the competition,” BBQ Guys has built a hot business around home furniture, fireplaces, and kitchen cookware – but the company’s true passion is barbecuing and grills. We’ve created our own YouTube channel around all things related to outdoor cooking, from recipe how-tos to grill reviews. For us, YouTube has been a recipe for success. Visit the YouTube blog to learn more about how we’ve used Google tools to build a fun, rewarding small business. Editors note: Today’s guest bloggers are Troy Olson, Digital Advertising Manager, and Jeff Loquist, Search Marketing Manager, for ShoppersChoice.com. ShoppersChoice.com owns and operates a family of web stores with a wide selection of products, from barbecue grills and accessories to patio sets. Editor’s note: Over 3 million businesses have adopted Google Apps. Today we’ll hear from Matt Zemon, President of American Support, headquartered in North Carolina. To learn more about other organizations that have gone Google and share your story, visit our community map or test drive life in the cloud with the Go Google cloud calculator. At American Support, we provide back office services to over 400 cable, phone and internet franchises in 29 states. Our services include billing and subscriber management along with 24/7 customer care and technical support. When I originally founded the company in 2006 we had a joint venture with a Philippines-based call center to provide customer service at a reasonable cost to our clients. In the first couple years of business it became evident that our clients and their subscribers wanted to have American-based customer service. Our clients were not happy with the off-shore customer service we were providing and we were having difficulties winning new business. As a customer service outsourcer the challenge was finding a way to provide the American customer service they desired at a price point they could afford. To save our business we ended up rethinking our business model and looking to the cloud to drive down costs and increase our efficiency. The first change was migrating to a call center in the cloud platform which enabled us to recruit, train and route calls to rural American home-based employees who needed and wanted the work. With this technology solution in place we began bringing our call center jobs back to America. As of May of last year we are a 100% American customer service organization. The second change was moving from Microsoft Exchange to Google Apps in 2009, which allowed us to more efficiently and effectively collaborate with our employees and clients spread out across the United States. Today we maintain a small office in North Carolina and a technical assistance center and network operations center in Montana. The rest of our management team is spread out between Arizona, Colorado, Kentucky, Georgia and Nebraska. Our entire customer support team works from home. Tools that fostered collaboration were absolutely essential to running our business. Each manager and their team really live in the Google Apps environment. All of their meetings are done through Google Docs and video chats. I’ve never met 90% of our employees in person. Every meeting agenda is built off of a doc with everyone logged into the same doc at the same time, taking notes and keeping track of next steps as we move along through the meeting agenda. Plus, our clients across the country have started getting used to the value of moving away from attachments to using Google Docs. Working together internally and externally is so much easier when we’re always sure we’re looking at the most current document and you can collaborate on it in real-time. Google Sites is also a key aspect of our business operations. We create a custom site for each of our clients that contains the most frequently asked questions, their unique policies and procedures, and other useful information for our teams. Sites allows us to keep all information in one place that everyone on the team can update and reference. We had initially looked at Google Apps for its 25 GB of mail and shared calendars, but it’s Google Sites, Docs and Talk that allow us to communicate successfully and efficiently so that we can support customers with a team all over the country. We attribute our successful collaboration and the ability to run a coast-to-coast virtual team to our use of Google Apps. The transfer of business information into the cloud is very straightforward. There is no need to install new hardware or software as everything is run by the cloud provider. Improved productivity: One of the key benefits of cloud computing is that employees can access documents and emails whilst away from the office. If your business demands mobility and flexibility or you have staff keen to extend their use of home or remote working, the cloud could be a straightforward and affordable way of addressing these needs. Manage the cultural adjustment: Today's employees expect to have the same technology at work that they enjoy at home. Google designs its applications with users in mind and many staff will already be familiar with Google Mail and Google Docs. However, internal communication about the change of service and in-house training sessions will help staff to feel more comfortable using the new technology. A more collaborative way of working: Using cloud computing applications, people can work more closely together, accessing and working in the same documents in real time - without the need for hundreds of emails with attachments. Improved knowledge sharing and communication encourages creativity amongst your employees which can help drive the business forward. Flexibility to scale up or scale down your business: Cloud based "pay as you go" style services allow you to easily increase your use of cloud services as your business grows, or decrease your spend if you need to temporarily scale down. Employees of tomorrow: Look at how teenagers interact - on Facebook, Bebo or MySpace - all cloud environments. These teenagers will soon become employees, accustomed to collaborating online and accessing their data from any mobile device at hand, not expecting to work in one location and from 9 to 5. More choice: In contrast to traditional IT models which can involve expensive software licenses and long lock-in contracts, the cloud model offers far more flexibility. You can switch provider far more easily and regularly in order to get the best experience and value for money. However, it is important to check with your cloud provider as to how you retrieve data from their cloud should you choose to switch in the future. A far off reality only a few years ago, today cloud computing has become mainstream. However, many small business owners we meet are still unclear about what cloud computing is and, more importantly, how it can benefit their business. If you're in this camp, you're not alone. A recent survey of European IT Heads by Portio Research found that 56% were not familiar with cloud computing. Cloud computing, or software as a service (SaaS), is when IT software and services are delivered over the web and through a browser. This transfers the responsibility for IT maintenance, software upgrades and any system issues onto the service provider, allowing enterprises like yours to focus on your core business instead of your infrastructure. That's why the cloud is especially appealing to small-to-medium sized businesses, which often have a smaller workforce and less capacity for time-consuming and expensive IT maintenance. Moving to the cloud is easy: The transfer of business information into the cloud is very straightforward. There is no need to install new hardware or software as everything is run by the cloud provider. to share the design experience with the rest of the world. Editor’s note: Over 3 million businesses have adopted Google Apps. To share their stories, we've talked to businesses across the United States. Today we'll hear from Mat Silverstein, Research and Development Officer for Pharmacy Development Services based in Florida. To learn more about other organizations that have gone Google and share your story, visit our community map or test drive life in the cloud with the Go Google cloud calculator. Based in Florida, Pharmacy Development Services (PDS) is a business coaching company that works specifically with independent pharmacies. Over the last 12 years, the company has helped hundreds of pharmacy owners build solid business plans and achieve success. Me: Did you get my email? Me: Check your spam folder. Co-worker: There it is. Wait. This is the old version of the document. I updated the document and sent it to you yesterday. Me: I know, but I couldn’t open it. I have an older version of the software you used. This scenario was typical, and it wasn’t until we moved to Google Apps that our team saw a huge boost in productivity. Right now, we have a team of on-site and off-site employees planning the biggest event in the history of our company; they’re using Google Docs to share the latest conference plans, instant messaging, integrated in Gmail, for quick communication, and Google Calendar to schedule all their meetings. The Gmail interface is light-years better than our old email system and we can access it anywhere. Some of us travel a lot, and accessing email from our iPhones, Android-powered phones, and Blackberry devices is essential — we couldn’t imagine it any other way. Information is ubiquitous; it shouldn’t be bound to a particular device.